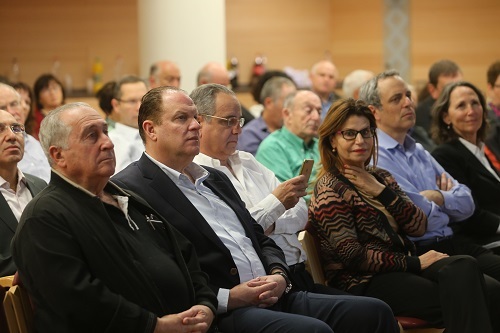 Hadassah Hospital management hosted a large delegation of business persons and leaders in industry and commerce from Jerusalem in a new initiative to enlist the local business community to advice and support Hadassah Hospital. 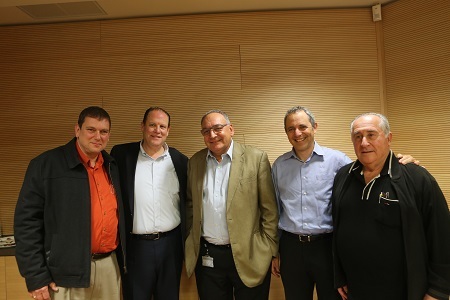 Initiated by Hadassah International Israel Director Meir Mark, the meeting was organized to present new medical and technological advances to the members of this dynamic sector of the city. Among the high-tech entrepreneurs, industrialists and public figures were Chairperson of the National Manufacturers Association, Shraga Brosh, who is also a member of Hadassah International Israel Board of Trustees; Jerusalem Manufacturers Association Chairperson Ran Tuttnauer; former Knesset Speaker and Hadassah International Israel Board of Trustees Chair, Dalia Itzik, and Hadassah International Israel Board of Trustees President, Sally Oren. The meeting was also attended by Erez Meltzer, Chairman of HMO Board of Directors, members of the Hadassah hospital, Medical Directors of Hadassah Ein Kerem and Mount Scopus Hospital and senior doctors and researchers of the hospital. Hadassah Medical Organization Director General Professor Zeev Rothstein thanked the business executives for their important role in the city. He presented his vision of a renewed Hadassah which will deepen its connections to the broader Jerusalem community. “When we speak of Hadassah, we know that the name of this wonderful institution goes before it, in Israel and abroad. All of us are working for a glorious future, and we see you, the leaders of the business and industry, as our partners. Together we will move Hadassah to an even better place.” He stressed that among his first steps at Hadassah was to enforce the rules about providing public medicine in the morning and allowing the choice of private care in which patients can choose their specific physicians in the afternoon and evening. “All of us are part of Hadassah,” said Prof. Rotstein. Prof. Eyal Mishani, Head of Research & Development Division and Head of Cyclotron/Radiochemistry Unit updated the audience on the frontiers of research being pioneered at Hadassah where physicians and researchers win a large percentage of research grants. He also elaborated on the opportunity to commercialize research ideas and products through Hadasit, the technology transfer company of Hadassah. 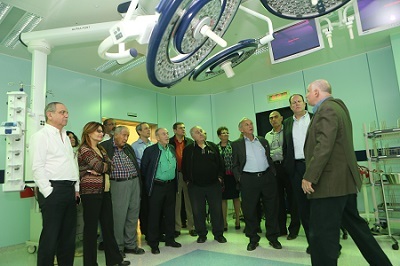 Prof. Yoram Weiss, Director of Hadassah Ein Kerem Hospital and Prof. Charles Weissman, head of the department of Anesthesiology and Intensive Care took the group through the new, protective underground operating room complex in the Sarah Wetsman Davidson Hospital Tower. The operating rooms, which will open next week, are equipped with the world’s most technically advanced equipment. The meeting ended with the promise of future cooperation between the local business community and Hadassah Medical Organization.